Find Similar Data for Excel helps to find cells with similar values in Excel worksheets and provides modification operation options. 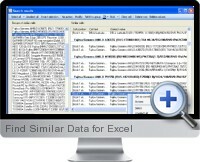 Quickly find errors made with cell data input values. Easily correct the mistakes based on criteria. Find and highlight cells which appear to be incorrect. Remove cell content with identical values. Highlight (change the background or font) of the cells with similar data. Clear the contents of the cells. Change the content of the cells. Copy the correct value to every cell of the group. Delete the entire row or column. Find Similar Data for Excel can also display cells with identical values in the final report in order to execute tasks such as removing duplicate values.